Amazing! Sitting in the Tampa Bay Times Forum, I witnessed magic. Chris Christie set the conservative world on fire, for one simple reason; he was able to express our passion to independents coming across live and on the television screen as simply having sincere compassion for our country's current fiscal health versus the media's favorite spin of conservatives being angry, frustrated or upset because our current president is black. Christie's passion is impossible to be spun into extremism or anger like that of others in our Republican Party because of his command of his fresh, modern brand of media, but this doesn't mean the media isn't trying. Today MSNBC here in Tampa pretty much tried to separate Christie from Romney, with Toure and Krystal Ball claiming Christie's speech was all about himself. 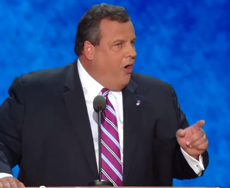 Their observation was that Romney wasn't too happy with Christie's speech. Personal narratives all of a sudden are not cool? MSNBC is so lost. That look on Mitt Romney's face was that of emotion, pride in having a colleague actually getting it! Christie was speaking for every conservative who cares for our American society with pride, aggressiveness and revealing what drives us against forces such as a desperate media and entrenched political forces. Christie's gift is revealing what drives leaders like Romney, Ryan, Daniels, Jindal, and not coming across as divisive to independents no matter what MSNBC says, and that is a powerful gift. MSNBC's Steve Kornacki's claim that Christie's speech was a "big waste" is a good sign that the Romney campaign's use of Christie as a weapon to reach the independent middle is working.